A direct cremation is a fuss-free way to arrange a cremation at a lower cost and with none of the ‘theatre’ that you would normally expect with a traditional funeral. The term ‘direct’ refers to the fact that the body is transported directly from the mortuary to the crematorium. It simplifies the funeral process, there are no viewings in a ‘chapel of rest’. A direct cremation can be organised without anyone from the family present (an unattended direct cremation) or you can choose to attend (referred to as an attended or simple cremation). Very often families will choose to have a separate memorial, celebration of life service or scattering of ashes some time after the cremation date. Why are direct cremations becoming more popular? The concept of a direct cremation is already familiar to people living in the USA, Australia and Canada, where it has been around for several years. There are a number of reasons why direct cremations are now on the rise in the UK. One reason is cost – a direct cremation can cost less than half that of traditional offerings. As the cost of funerals continues to increase, families are seeking lower cost alternatives. This also means they can divert more of the budget to organising a separate commemoration at a later date. Secondly, the traditional funeral procession with a black hearse, led by funeral director in a dark suit and top hat followed by family members in limousines, with a sombre funeral service and all the bells and whistles holds less appeal these days to those with a more modern or secular outlook to life (and death). And thirdly, families are increasingly interested in celebrating the life of their loved one than purely mourning their loss. A direct cremation separates the cremation process from the funeral service, giving you more time to organise the send-off that you would like. A direct cremation is not always chosen purely to save money. High profile trailblazers such as David Bowie, who in 2016 opted for a no-frills direct cremation in New York, have helped to fuel interest in direct cremations. How long does a direct cremation take? A common misunderstanding is that a direct cremation happens immediately after death. In the UK, there’s a process to follow (more on this below) but the cremation cannot take place until the death has been registered and the relevant paperwork completed. This means that in practice, the cremation typically takes place a week or two after the death. Hospital mortuaries are usually able to accommodate this timescale. In terms of the actual cremation itself, most crematoria provide either 30 or 40 minute slots for the cremation service. The ashes are normally ready for collection a day or two later. Non-attended direct cremations typically cost from £1,000, a figure which may not include additional extra costs (known as disbursements). These are things like doctor’s fees and crematorium fees which will add a few hundred pounds to the final bill. For most direct cremations, booking a weekday morning slot at the crematorium keeps costs down, as well as using a simple coffin. 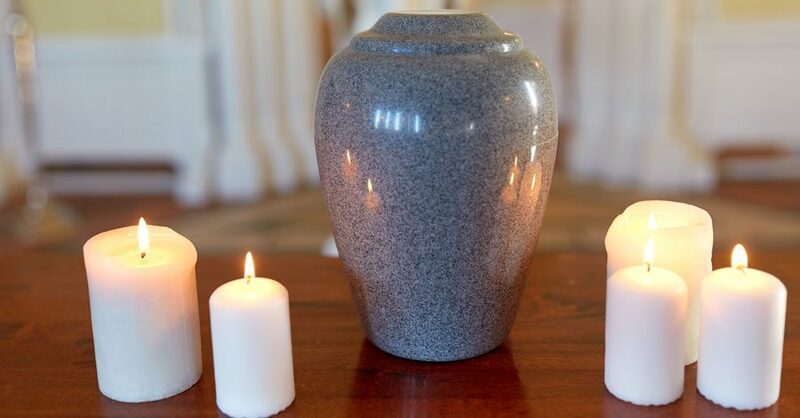 At White Rose Cremations, we also provide attended or simple direct cremations where you can have family or friends present at the crematorium. A simple committal service can be arranged, led by the family or a celebrant. With photos of your loved one on display and specially chosen music, you will find it a personal, dignified and meaningful experience. What happens with the ashes after a direct cremation? That’s up to you. The ashes can be scattered at the crematorium’s remembrance garden or they can be delivered to the family so that they can organise their own scattering of ashes. Cremated remains can also be buried at certain woodland burial sites, either scattered loose or in a biodegradable urn. Can you still have a funeral service with a direct cremation? With a direct cremation, it usually means that there is no funeral service – people even refer to it as a “no funeral” funeral. However, if you choose to have an attended direct cremation, mourners can be present for the committal. This can be family-led or you can have a funeral celebrant leading the short service in the crematorium chapel. More typically with a direct cremation, families are choosing to organise a separate memorial ceremony some time after the cremation has taken place. This may be a celebration of life service or an informal gathering at the time the ashes are scattered or interred. How to organise a direct cremation? You then need to apply for the cremation by completing Cremation Form 1. Various cremation forms can be downloaded here. The cremation should then be booked with your preferred crematorium. Bear in mind that the timing of the cremation service can have a significant impact on the cost – early morning slots are normally by far the cheapest options. There’s a number of other practicalities to take into account, from transportation of the body to obtaining a coffin and urn for the ashes. For this reason most families prefer to contract with a direct cremation specialist to take care of the arrangements rather than organising it themselves. If you are looking for a low cost affordable direct cremation specialist in London or Surrey then contact White Rose Modern Funerals on 020 3281 1045. We are based in Teddington, Richmond upon Thames and a member of our team will be happy to meet with you to discuss our options. We can arrange low cost direct cremation funerals in SW London and Surrey. Are you allowed to take ashes abroad?